In the build up to Santa time, I’m going to taste some whiskies that are going to be well received as presents or enjoyed as a wee dram after the olympic sport that is eating Christmas dinner. 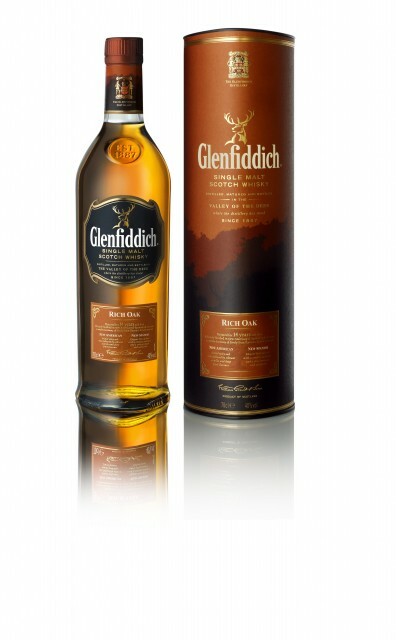 The first whisky I have chosen is Glenfiddich 14 year old Rich Oak. Matured in ex bourbon casks for a period of 13 years. The batch will be split at this point and a percentage will be finished in New American oak and a percentage will be finished in New Spanish Red oak.It will be then vatted back together and bottled. Nose: Creaminess, pralines, green apples, pears and cooking apples. The new oak comes through, and there are some similarities to that of a Bourbon. This is balanced by the apples and pears that show off the Scottish and Glenfiddich style. Palate: Pears, aniseed, cinnamon, plums. A very fruity, tasty dram. The Spanish Red oak comes through with a delightful Christmas cake taste. It is a very easy drinking whisky, but it does have some complexity to it. I would love to try some of the cask samples. I think it would be amazing to try the components of this whisky at every stage of maturation. Is that a bit geeky? Probably. It’s a really good dram. I would love to try it at cask strength, since I almost feel it holds back slightly. For my own taste buds, at cask strength it would be excellent rather than really good. I’ve bought a bottle though, which I feel is the highest praise I can give. Actions speak louder than words. This entry was posted	on Monday, December 20th, 2010 at 11:12 am	and is filed under Reviews. You can follow any responses to this entry through the RSS 2.0 feed. Responses are currently closed, but you can trackback from your own site.